Sift 1 cup flour, sugar, baking powder, salt, and spices into mixing bowl. In separate bowl, stir together pumpkin, butter, and eggs. Add to dry ingredients and mix on medium speed until smooth, about 30 seconds. Add remaining 2 1/2 cups flour and mix on low speed until just combined, about 30 seconds. Turn out onto floured surface and let sit 15 minutes. Roll out to 1/2-inch thickness with floured rolling pin, or pat out with floured hands. Cut out doughnuts and holes with floured cutter. Transfer to a baking sheet lined with wax paper. Brush off excess flour. Let sit 15 minutes. Meanwhile preheat oil in Presto® deep fryer. If using an adjustable thermostat deep fryer, set at 375°. 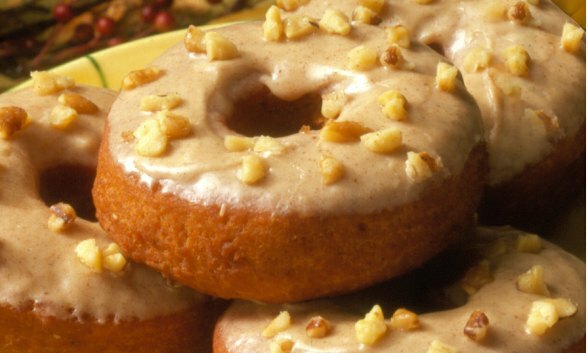 Prepare Spiced Brown Butter Glaze (see recipe below). Fry a few doughnuts at a time until golden, about 1 minute per side. Do not crowd fryer. Drain on paper towels. Dip warm doughnuts in glaze. Transfer to rack or tray until set. Melt butter in small saucepan over low heat. When melted, continue to heat butter over moderate heat until it begins to brown. Watch carefully. Remove from heat as soon as butter reaches a golden brown color. It will move quickly from golden to black (burnt) if not watched. Let cool. In small bowl, sift together sugar and spices. Gradually mix in cooled butter, vanilla, and enough milk for desired consistency. Sprinkle chopped walnuts over glazed doughnuts. Do not use a frying basket with this recipe.